INTREPID returns to Jerusalem – and to Zichron! 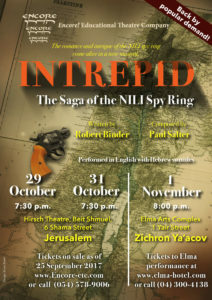 Our recent production of Intrepid: The Saga of the NILI Spy Ring, which premiered at the Hirsch Theatre, Beit Shmuel, Jerusalem, in June, will be presented again by popular demand at the Hirsch on Sunday, 29 and Tuesday, 31 October (evenings at7:30 p.m.) and at the Elma Arts Complex in Zichron Ya’acov on Wednesday, 1 November (the eve of Balfour Day). Joining the outstanding cast of this production will be Goni Knaani, a highly talented opera singer and cabaret artist from the New Israel Opera, Tel-Aviv. Tickets to the Jerusalem performances are now available through our box office, www.Encore-etc.com online or (054) 578-9006. Tickets to the Zichron performance will be available through Elma, or (04) 630-0123. The romantic and intriguing story is set in and around Zichron Ya’acov a century ago, when a young group of determined Zionists succeeded in conveying important military information about the Ottoman Turks to the British command in Egypt. The result was that General Allenby was able to use this information in conquering Eretz Yisrael. At the same time, Aaron Aaronsohn, one of the originators of the spy ring, played a major role in formulating the Balfour Declaration that was issued at about the same time. Sadly, all the leaders of NILI (acronym for Netzach Yisrael Lo Yishaker – “The Eternal One of Israel will not be false”) came to a tragic end, but their tale remains as an inspiring legacy. The music for the new work has been composed by Paul Salter, with libretto written by Robert Binder, who collaborated several years ago on the chamber opera, The Keys to the City, commemorating the “surrender” of Jerusalem by the Ottoman Turks to the British in 1917, and who, of course, have been responsible for Encore! productions over the past decade. An outstanding cast of performers has been assembled to portray the historical characters of Intrepid: Aviella Trapido (Sarah Aaronsohn), Rafael Apfel (Avshalom Feinberg), Michael Sacofsky (Aaron Aaronsohn), Hanan Leberman (Yosef Lishansky), Maya Ben Yaacov (Rivka Aaronsohn), Claire Greenfeld (Tova Gelberg), and a supporting cast of Encore! veterans and newcomers. The performances will be accompanied by an orchestra, with arrangements by the composer. Roxane Goodkin-Levy has created a series of paintings of historical sites that will be projected on the screen to frame each scene. 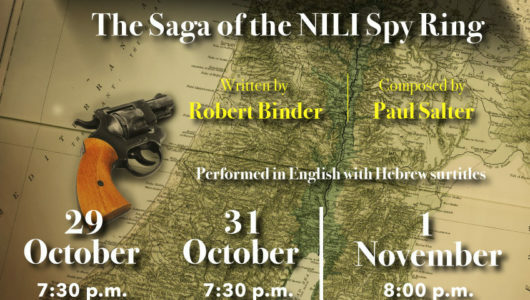 Don’t miss this opportunity to see Zionist history come to life on Encore’s stage!